If we start today, Wellington could have a world-class light rail tram service between the Railway Station and the Airport, via the Hospital, by 2030, for an estimated cost as low as $450 million. A city where walking, cycling and electric public transport are actively promoted to reduce transport costs, improve health by physical exercise and reduce pollution and climate change effects. In collaboration with Generation Zero, we have reviewed the latest business plan for the development of public transport in Wellington. We consider there are grave deficiencies in the proposals for BRT and the spine study on which it is based. In particular, the underlying assumptions adopted for light rail in the spine study inevitably gave a high-cost, low-benefit option. We believe these assumptions are no longer appropriate. We believe that the spine study identifies the wrong route for rapid transit from the CBD to Kilbirnie. We also believe that alternative routes exist which avoid the choke point at the Basin Reserve, and that light rail would provide a far more cost-effective solution than the BRT currently proposed. The body of this report presents evidence to support this view. This report presents options for light rail through central Wellington to Kilbirnie and on to the Airport, together with a supporting bus network. We acknowledge that there are other route options for light rail than those presented here; in particular, we recognise the desirability of operating along the full length of the golden mile. A route via the Basin Reserve would also be feasible. With the introduction of light rail along one of the identified routes, buses in the central city can be reduced to manageable numbers. BRT for Wellington will not be rapid and will not meet the minimum internationally adopted standard requirements for a bus system to qualify as BRT. We expect that light rail in Wellington will be cheaper than the street-widening and amenity costs of BRT. the need for large cumbersome buses to gain capacity—these pose dangers for other road-users. High capacity also demands frequent buses, which are too easily slowed by delays at traffic signals or bus stops. BRT needs a high priority at traffic signals (or a flyover) and overtaking lanes at stops. BRT can be space-intensive; for example, BRT stops in Brisbane are nearly twice the width of Manners Mall (27m versus 15m). 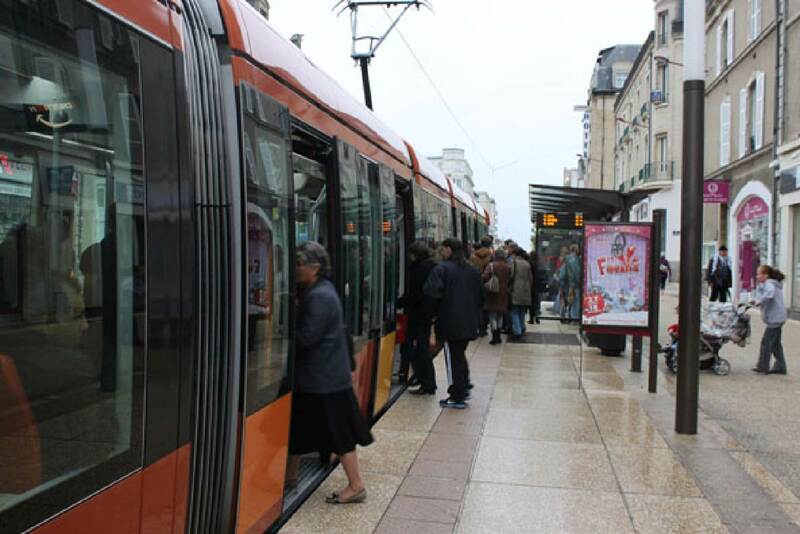 Peak capacity for light rail running on-street is about 40 trams an hour: lower than for buses because there is rarely space to berth two trams at a stop. Light rail capacity depends on vehicle capacity rather than frequency, carrying around 300–400 people in Wellington. Even a few buses sharing a light rail route will disrupt route capacity, but excluding all buses from the central city may not be possible: Wellington needs a second route for the remaining buses. Planned, near-seamless transfers at quality interchanges are necessary for light rail in Wellington, and all quality, city-wide systems. Transfers will dramatically reduce bus-kilometres, mainly on the golden mile, allowing more and better services on remaining routes. Good design of interchanges and timetables minimizes transfer times (generally 2–5 minutes),1 making many trips faster overall. Transfers are a successful and uncontroversial feature of most overseas public transport systems, including those using BRT. The claimed unpopularity of transfers in Wellington is based on unsatisfactory questions posed in the spine study without balancing information. This approach unnecessarily biased respondents against transfers, e.g. Do you want to break your existing journey by making a transfer? Do you want faster, cheaper and much more reliable trips, anywhere-to-anywhere? Of course nobody wants transfers if they can avoid them. But no information was given on how the inconvenience can be minimized or mitigated when combined with modern light rail. Respondents will have in their minds the painfully slow and erratic transfers experienced in Wellington. And, of course, everybody wants faster, cheaper and much more reliable trips anywhere-to-anywhere, but can be put off by biased questions. This bias compromises the validity of the spine study’s conclusions. This section presents options for light rail from Wellington Railway Station to the Airport, via Wellington Hospital. 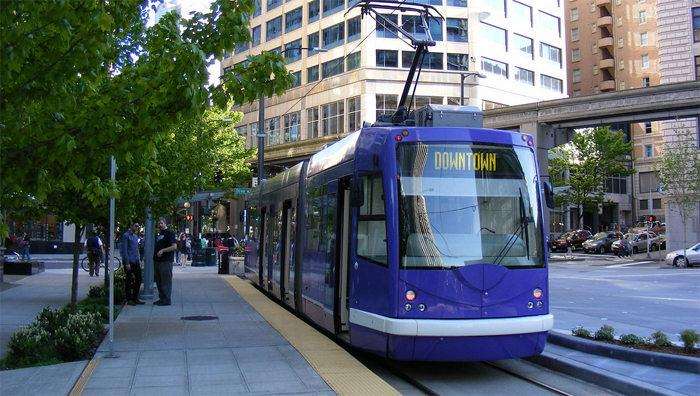 We have identified feasible and affordable options for light rail and a supporting bus network. We are confident that we have workable options, combining buses and light rail, but have not identified a best or preferred option. We propose buses and light rail on fully separated routes, both on or close to the golden mile. We have identified a single light rail route from the Railway Station to Wellington Hospital, Kilbirnie and Wellington Airport, with options in three places: south of the Railway Station; the Michael Fowler Centre; and Wellington Hospital. Only the last option, 3a or 3b, will materially affect costs. See Light rail route and options. Speed throughout the route, with an indicative travel time to the Airport of 20–25 minutes at any time of day. The best service provided where demand is greatest: the Te Aro mixed use development area; high residential density and education destinations in Mt Cook; existing and planned residential density around Adelaide Road; Wellington Regional Hospital; high-density mixed-use in Newtown; high residential density and planned revitalization in Kilbirnie. Excellent timekeeping at all times of day, which makes consistent timetables and timed transfers practical. Very smooth ride. A common sight on light rail is passengers standing when there are plenty of seats. Quiet, with zero emissions from the vehicle and almost carbon-free running on electricity from renewable sources. The identified route does not run by the Basin Reserve, although it is within the area defined in the N2A study. Recent events suggest difficulties in finding a reserved route, and multi-segment trams can be difficult on large, multi-lane roundabouts. This corridor is more suited to buses, with no particular reason to run a high-capacity route that way. or a waterfront route along the east side of Customhouse Quay. Principal considerations in deciding between options will be vehicle speed, walking distance and passenger numbers walking. Further investigation is needed to determine whether a dedicated light rail route on Lambton Quay south of Panama Street is feasible, as this would require removing buses from this part of Lambton Quay. 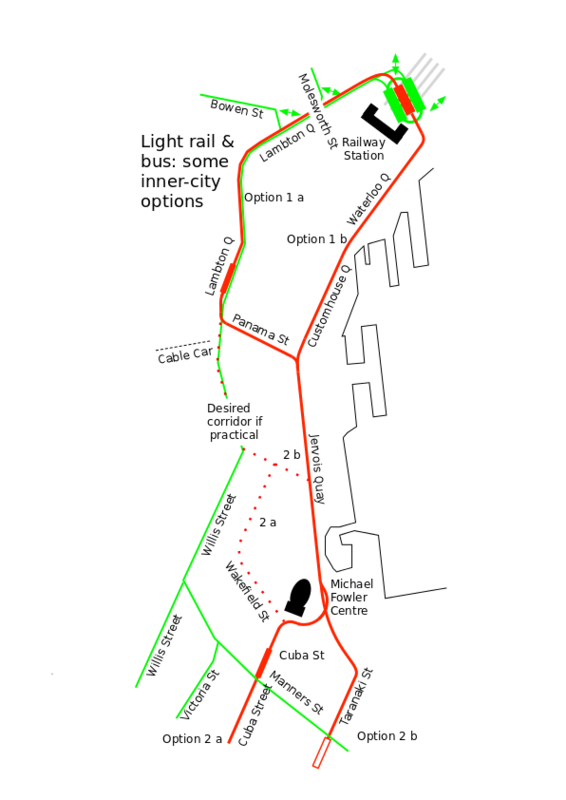 Such a route would then follow Willeston, Victoria and Wakefield streets to Cuba St (option 2a) or Willeston St to Jervois Quay and Taranaki St (option 2b). We have identified this as a desirable route, but do not have enough information to determine feasibility and cost. In the southern CBD we propose either a Cuba St route or a faster route via Taranaki St (options 2a and 2b); Wallace St with access to Wellington High School and Massey University; then on to Newtown via John and Riddiford Streets via Wellington Hospital. This route, running west of the Basin Reserve, would be better aligned with the light rail design principles, with more opportunities at the Hospital and through Newtown. The curves in the John St area mean slightly reduced operating speeds. South of Wellington Hospital we propose a route to Kilbirnie by either Wellington Zoo or Constable Street and Crawford Road (options 3a & 3b). In each case the proposed Kilbirnie interchange is on commercial land at Coutts Street, opposite Bay Road. These options have important cost effects, because of tunnels: option 3a will cost an additional $212 million. This area is discussed further in Indicative costs. The main advantage of a Constable Street route is cost because it bypasses the longest tunnel. The main disadvantages are loss of patronage in the denser Newtown area, and a more difficult route in Kilbirnie. For option 3a we propose a single-track tunnel to Kilbirnie. Single track is justified because the heaviest light rail traffic will be in the city centre and a reduced service can be justified south of Wellington Hospital. 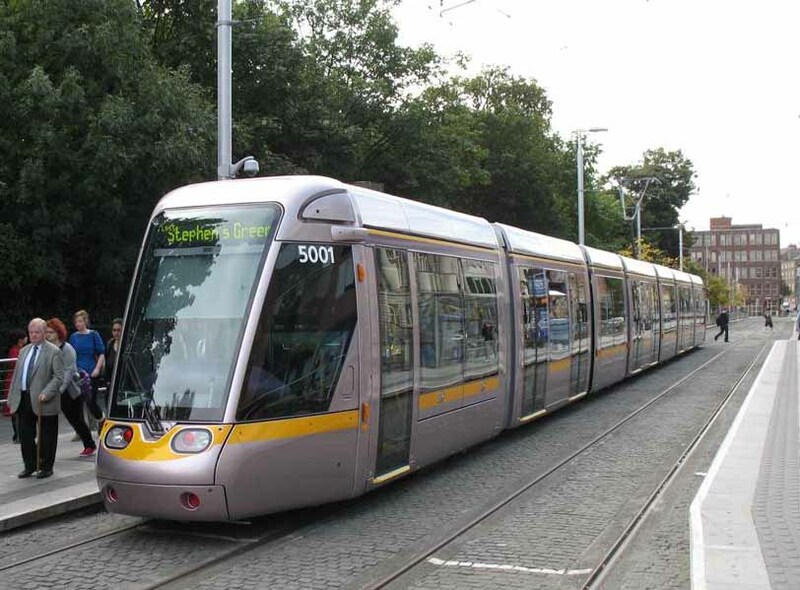 Tunnel capacity should be at least 12 trams an hour each way, or say 3500 passengers an hour. This is an initial estimate and can probably be increased after timetable modelling. A second tunnel will be needed if capacity is ever reached. Either option will require a tunnel beneath the airport runway. A single-track tunnel will be satisfactory for option 3b, but option 3a may need a two-way layout. This can be checked using timetable modelling but is assumed at this stage. Managing westbound traffic reaching Constable Street, to control queue-lengths at traffic signals and minimize peak-hour delays to westbound trams. The lower end of Crawford Road, which is less than 11 metres wide. Full service on short routes incompatible with transfers, such as Brooklyn; Mt Victoria; Aro Street or Kelburn; or busy corridors requiring two transfers. A “virtual” regular service from the Railway Station to Courtenay Place, for passengers wanting closely-spaced stops. This would be several routes timed to collectively provide a consistent service: say every five minutes. Possibly a full service on some longer routes such as Karori. In this case the route should probably pass through the Railway Station interchange, if not terminate there. These needs will have to be “rationed”, to manage a peak-hour maximum of 60 buses an hour on all routes (for congestion-free running) and the cost of running buses and light rail in competition. Other bus services would terminate at one of the interchanges. The first light rail line in a new city typically takes 10 years from the go-ahead: the existing bus route will need alterations to boost capacity until light rail can take over. No costly structures needed, other than tunnels, costed separately. The heaviest other cost will be Wellington Railway Station. A waterfront route would push down costs because it avoids the worst areas for costly underground services diversions. Other cities have reduced costs up to 20% using joint procurement (Amiens and Caen for example) and Wellington may be well-placed to do the same by pairing with Auckland. Ground conditions are such that the tunnelling cost estimated for Mt Victoria is applicable. 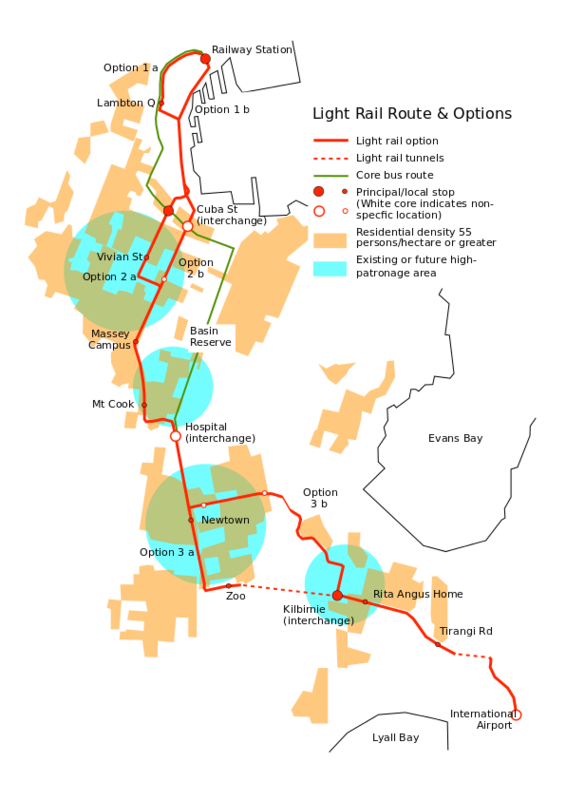 Reaching capacity in the Mt Albert tunnel is sufficiently far into the future to justify an initial single-track tunnel. A single-track tunnel under the airport runway will be sufficient for option 3b. Option 3a is likely to need double-track, because of the timetable effects of two nearby single-track tunnels. This can be confirmed by modelling at the design stage. Instead of two runway tunnels, a single larger tunnel with a central fire-wall will be sufficient, at an assumed saving of 25% overall. We acknowledge there are challenges in the Constable St option, but are confident that the engineers could find workable solutions. Clearly, the cost saving would be considerable—enough to fund over 4km of light rail construction, such as a line to Island Bay. A detailed study will be needed to determine which option is best value for money. Include a light rail option in the full BRT business case for assessment by Councillors and the public, based on this new information. Engage in constructive and collaborative discussion with officials of the options presented here, with a goal of light rail to the airport by 2030. 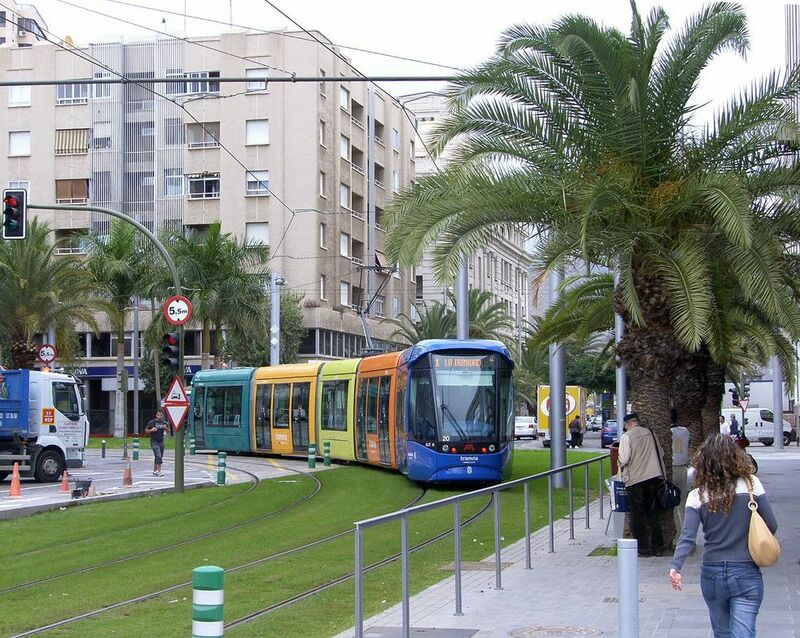 Promote informed public discussion of transport options for Wellington, including light rail.